We have seen the excitement building around 3d printed chocolate, but let?? ?s get serious here ??? it?? ?s important to plan for a more balanced diet when it comes our fabricated food future. So let?? ?s keep those chocolates for dessert, and see what Cornell?? ?s Creative Machines Lab have been cooking up. 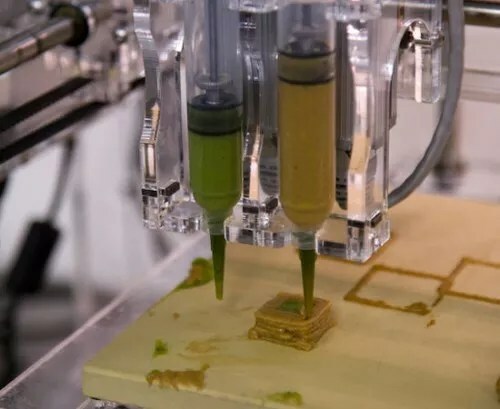 The proposition is to build a low-cost 3d printer that can handle more than the regular sway of fluid foods (melted chocolate, cheese, cookie dough etc). Talks are currently underway with Essential Dynamics, a tech startup who plan to produce a commercial version of the Cornell designed 3d food printer that should be priced at around $1000. Founder Jamil Yosefzai believes that the time will come when every kitchen has its own 3d food printer, and he plans to be at the forefront of the customized food revolution.